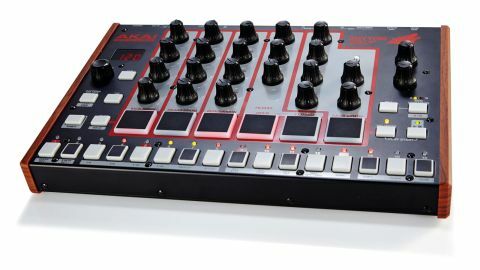 Some solid drums, a usable bass synth and strong sequencing capabilities make this a good deal! It's cheap, portable and feels well-built for the money. It's fun to program and easy to get around. There are some solid sounds onboard and the sequencer has MIDI/gate out. Could do with a shorter decay. Kick volume could be louder. Finally, after its announcement at Messe 2014, the Wolf has now made it to market and we can place it under the microscope. The Rhythm Wolf is a two-part machine - an all new analogue drum machine paired with an analogue monophonic bass synth. This is all mated to a 16+16 (A+B) 32-step sequencer. The main circuit board is hackable Korg Volca style (with hackable points marked on the board) and individual outputs can be added for the drums, amongst other hacks. "All the buttons and rotary pots feel surprisingly tight which we weren't expecting at this price point"
The Wolf looks great (even the fake wood ends fooled us at first!) and build quality is solid. There's a heavy metal chassis and the panel is nicely spaced out with its red backlit velocity sensitive MPC pads taking centre stage. All the buttons and rotary pots feel surprisingly tight which we weren't expecting at this price point, whilst the interface is generally intuitive and inspiring to tweak on the fly and you'll find yourself making beats quickly. On the left of the front panel there's a three-digit display (which displays tempo and selected patterns amongst other things), plus a small rotary encoder for quickly zapping through data values. There's a tap tempo button which is handy if you want to sync your Wolf to live performances with a live click-less band, whilst under this button you'll find a Pattern Select button. Press this, then use the encoder or the step buttons to select from the 16 user-writeable patterns. Pressing Shift + Pattern Select accesses Active Step mode for shortening/lengthening your patterns for variations on the fly, or for making short or uneven length fills. Next to the Shift button is a Mute/Solo button - hold this down, press a pad and that pad/track is muted/soloed. Each of the nicely sensitive MPC pads is hardwired to a specific instrument. Pad 1 for Kick, 2 for Snare, 3 for percussion, 4 for open hat, 5 for closed hat and pad 6 for the bass synth. If you connect MIDI out (or the Gate out) to another instrument (I connected the Wolf's MIDI out to my Moog Voyager's MIDI In), the Wolf sends out MIDI/Gate information corresponding to the sequence that has been recorded. You can thus sequence another monophonic instrument from the Wolf (and it works very well too) plus you can also turn down the internal bass synth volume completely or, instead, layer an external instrument and the Wolf's bass synth together. Also, if you connect an external keyboard, controller or your DAW to the Wolf's MIDI input, you can trigger the Wolf's bass synth and drums. In addition, you can MIDI-sync the Wolf's sequencer to your DAW. Note that there have been complaints that the Wolf's bass synth doesn't tune/scale properly internally/over MIDI but Akai have released a Wolf Tuning Utility (Windows/Mac from the Akai site) that addresses this. Sonically, the bass synth isn't very versatile (and there's no glide) but with no resonance it has a weighty sound, plus you can set it to square or saw for hollow/nasal characters. The resonance adds juiciness at lower settings (along with the envelope amount/decay) but it acts as a pseudo high-pass filter at higher levels, resulting in thinner sounds. Importantly, the bass synth has a dedicated output so you can externally process the sound using outboard EQ, filtering, compression or FX. "Despite the naysayers lambasting it, it still sounds warm, round and heavy"
Each drum type has three dials and a volume control above its corresponding pad. The kick has decay, attack and tune; the snare has, decay, noise and tune; the percussion has low tune, noise and high tune; and the hats share decay and tune. The kick sounds round/full with a nice heaviness and the attack control adds some click/attack at higher settings, whilst you can obtain classic long booms with decay set to full. If you desire a very short bass drum, turn tuning to the far left and set decay to shortest (though we wish the decay would go even shorter). Our other complaint is that the kick volume doesn't go as loud as the snare but you can always bring down the snare volume to compensate. The snare sounds decent too - without noise added you get a useful rimshot-like sound but add in noise and mess with the decay and you can get snapping/softer snares and noise blasts, though the tuning is subtle at best. The percussion is similar to the snare but it's slightly more versatile - there's control over the low and high tune in addition to the noise control but it would really benefit from the addition ofahigh-passfilter. Finally, the hats (well we should say the hat as it's one shared sound) sound nicely metallic and shiny, though again tweaking tuning has little effect. However, the decay control enables everything from a short click to a long open sound and, with velocity applied via the pads, the hats (and all the other sounds) come to life. Note that the open hat pad simply triggers a longer version of the closed hat, so you can't trigger the open and closed hats simultaneously. So, the Wolf certainly isn't perfect but at £149 it's still a tempting purchase. It can make solid beats/basslines and the good interfacing, external sequencing capability and mod-ability are major bonuses. Despite the naysayers lambasting it, it still sounds warm, round and heavy. Yes, the control over some sounds is minimal (and it would have been great to have the option to route the drums through the bass filter, plus kick decay could go shorter, and there's no copy A to B) but, against the competition, the Wolf holds its own, particularly as you get an analogue drum machine and bass synth for a minimal outlay.